As most of you already know, it is with great heavy heart that I regret to inform you that our President signed H.R. 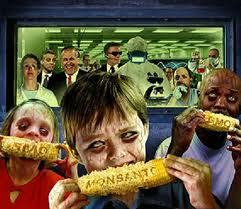 933, which contained the Monsanto Protection Act into law. Do you feel that there needs to be a paradigm shift? The purpose of me sharing the following information (it isn’t news to many of you) isn’t to depress you. Awakening happens when one is informed. And real change won’t happen if there is no awakening. Thanks for sharing this interview Stacey. Now more than ever, we as consumers MUST act collectively. We obviously cannot count on our representatives to listen to us even if we are many and loud. Boycott These Brands these companies do not support your right to know if you’re eating genetically engineered foods! 3. “H.R. 933: Department of Defense, Military Construction and Veterans Affairs, and Full-Year … (Concurring in the Senate Amendment)”, which contains Section 735, the Monsanto Protection Act passes Congress 318-109. This entry was posted in Lyme Symptoms and tagged GMO's. Bookmark the permalink.